Blood pressure is the force of blood pushing against the blood vessel walls. The heart pumps blood into the blood vessels and the blood is carried throughout the body. An increase in the normal pressure level is termed high blood pressure and is also called hypertension. It is dangerous because it makes the heart work harder to pump blood to the body and leads to hardening of the arteries, or atherosclerosis, and can ultimately lead of heart failure. The exact causes of high blood pressure may not be pointed out. There are several factors and that play a role in increasing the blood pressure. They are smoking, overweight or obesity, lack of physical activity, too much salt in the diet, too much alcohol consumption, stress, older age, genetics, family history of high blood pressure, chronic kidney disease, adrenal and thyroid disorders etc. One or more of these factors can cause the blood pressure to rise. Hyperexol, a dietary supplement, is a nutritional herbal mix prepared to supply essential elements that are absent in the everyday diet. 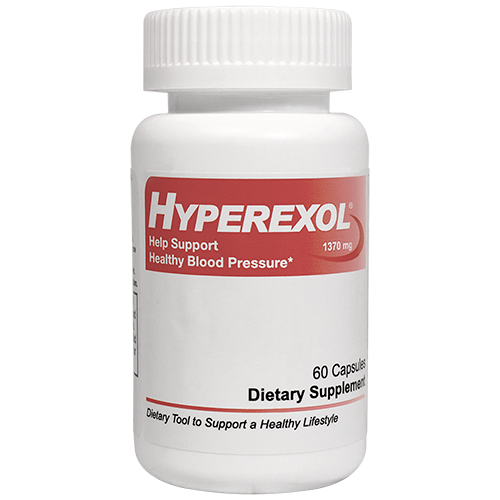 The natural nutrition in Hyperexol helps support your dietary choices for healthy blood pressure. Hyperexol has no side effects of any kind. Physicians prescribe medicines to reduce the higher pressure. They may or may not have side effects. It changes from person to person. Some may have and while some may not. Some of the reported side effects of blood pressure pills are constipation, headache, dizziness, swollen ankles and irregular or very rapid heartbeat or palpitations. Since the heart is the most important organ in the body, taking care of the same is utmost important. Change in eating plans can make a huge difference to the health. Include plenty of fruits, vegetables, whole grains, fat-free products, low-fat milk products, seeds and nuts, beans and fish in the daily diet. There should be limitation is taking too much sweets, beverages, red meats and salt. Eating a healthy diet alone cannot help maintain healthy blood pressure levels. You should also make sure to be physically active. Routine physical activity can lower blood pressure and reduce your risk for health problems. If you are a smoker, quit smoking, since it can damage blood vessels and raise the risk of hypertension. Hyperexol, a dietary supplement, is a nutritional herbal mix prepared to supply essential elements that are absent in the everyday diet. As part of a healthy lifestyle, the natural nutrition in Hyperexol helps support your dietary choices for healthy blood pressure. Similarly, Hyperexol contains a proprietary mix of naturally occurring vitamins and minerals prepared for the better health. Take two capsules of Hyperexol per day. If having difficulty in swallowing mix the contents in the capsules in a glass of water and have it, as simple as that. Besides, Hyperexol has no side effects of any kind. It is easily available without a doctor’s prescription. The product comes with a 60 day satisfaction guarantee and promises return of the product under the terms and conditions.